STONY BROOK, N.Y. – Despite 16 lead changes, the UMass Lowell men’s basketball team (13-12, 5-5 AE) faced a 76-65 setback at Stony Brook (20-5, 8-2 AE) on Saturday evening. Redshirt-junior Christian Lutete (Silver Spring, Md.) turned in his ninth double-double of the season and second consecutive with 19 points and a season-high tying 14 rebounds. Sophomore Obadiah Noel (Frederick, Md.) joined Lutete as the team’s only other scorer in double figures with 15 points. Freshman Joey Glynn (Portsmouth, N.H.) chipped in with eight points, as well. The River Hawks came out hot from beyond the arc, as threes from redshirt-senior Josh Gantz (Grove City, Ohio) and freshman Darius Henderson (Pasadena, Calif.) helped the team build an early, 11-5 margin. However, the Seawolves answered with a 10-3 spurt to pull in front, 15-14, with 12:43 remaining in the first half. The teams battled for a slight edge with two more lead changes before the River Hawks recorded nine unanswered, including five from Lutete, to take a 29-22 advantage at 4:35. Stony Brook followed with a 12-2 run, though, making the score 37-33. Senior Shawn Jones (Bridge City, La.) would pull down an offensive rebound in the final seconds of the half and dish it inside to Noel, cutting the difference to just two at the break. Lutete tallied the first five points coming out of halftime, giving UMass Lowell the upper hand, but SBU capitalized on six straight free throws to lead, 43-40, with 16:24 left to play. Freshman Bryce Daley (Pittsfield, Mass.) and Glynn were able to combine for the next five points, giving the visitors a one-possession edge. The game remained closely-contested with two tied scores and one more River Hawk lead at 48-47 with just over 13 minutes to go thanks to a bucket from Noel and a free throw from Gantz, but Stony Brook used a 17-6 run to take the lead for good, 64-54, at 7:01. 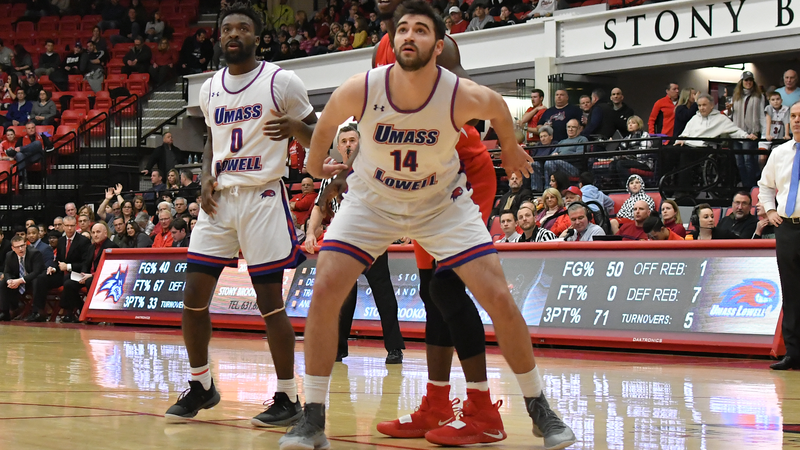 UMass Lowell pulled within six down the stretch, although the Seawolves held on to secure the 76-65 decision. The Seawolves now lead the all-time series 15-5 against UMass Lowell. Next up, the River Hawks will travel to UAlbany for a 7 p.m. tipoff on Wednesday, February 13.